Edo State have been awarded hosting rights to the 20th edition of the NationalSports Festival to be held in 2020. 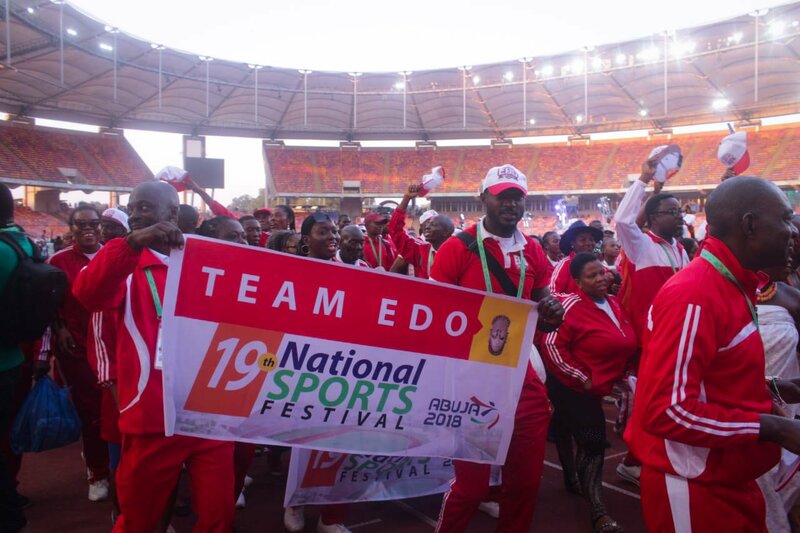 The announcement was made by the sports minister, Solomon Dalung, in the presence of the Edo State Governor Godwin Obaseki at the closing ceremony of the 19th National Sports Festival in Abuja on Sunday. Dalung said the decision to award Edo State the hosting rights to the 20th National Sports Festival was taken “after a thorough evaluation” of their plans and also after having considered “other variables”. He said that the timing of the announcement was to ensure “that enough time is given to the hosts of the 20thedition of the festival”. The National Sports Festival had suffered an uncertain future in recent times after Cross River State reneged on its commitment to host the 19th edition of the Festival in 2014 having acquired hosting rights in 2012. To forestall a recurrence of the Cross River situation, Dalung who said that the 15th February 2018 decision of the National Council of Sports that called on the Federal Capital Territory to step in as hosts of the 19th NSF at short notice has “restored life to the National Sports Festival” urged “the government of Edo State to put all machineries in motion to ensure a seamless 20th National Sports Festival including the immediate setting up of a Local Organising Committee (LOC)”. He said that the Sports Ministry will “provide the logistics and technical support for a successful hosting” while also thanking Delta, Imo and Cross River states for showing interest in hosting the festival. In a speech accepting the hosting rights on behalf of the people of Edo State, Governor Obaseki pointed to “a massive refurbishment of our sporting infrastructure” as proof that Edo State can stage a successful hosting of the 20thNational Sports Festival. “We have the capacity and capability to host the games,” said Obaseki. “We have perhaps, one of the best governance systems in sports in this country in Edo State and over the last couple of years, we have been undertaking a massive refurbishment of our sporting infrastructure in our state. “We have no doubt that we have the capacity, we historically have been part of the National Sports Festival, we understand and appreciate the objectives and goals of this Festival and I make a commitment on behalf of the people of Edo State that we will keep to the objectives, the goals and intents of the National Sports Festival,” he said. This would be the second time Edo would be hosting the festival after hosting the 2002 edition although they hosted the 1981 edition as part of the old Bendel State.